At least 17% of all highway crashes are the result of distracted driving, according to the National Highway Traffic Safety Administration. That translates to approximately $148 billion a year — $47 billion in in physical damage plus $101 billion in “societal harm,” such as traffic congestion and lost productivity. Distracted driving can be visual — taking your eyes off the road; manual — taking your hands off the wheel; and cognitive — taking your mind off driving. Using the car’s navigation system or talking with passengers or eating while driving are forms of distracted driving. But the most common and lethal form of distracted driving involves using hand-held devices while driving, namely using a cellphone. Texting behind the wheel is illegal in 47 states and the District of Columbia and 14 states make using hand-held cellphones illegal. 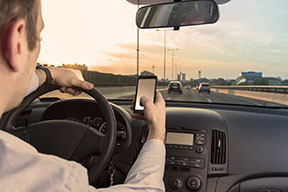 Most people are aware of the hazards and illegality of using cellphones while driving, but laws, common sense and company policies often have little impact. “More training is probably one of the worst solutions for this problem,” said Michael Davis Sr. VP and risk control leader for Lockton Companies, Houston, in an interview with Business Insurance. “It’s an easy thing to adopt (for companies) because (they) can say, ‘Hey, we sent out a memo,’” says Davis. He thinks technology offers the best solutions for reducing distracted driving. There are a growing number of firms starting to work on ways to keep people from using their cellphones, especially people who drive as part of the job. Cell phone blocking: Blocking apps can be downloaded and activated to the cellphone or installed in vehicles as a “geofence” or virtual barrier around drivers, preventing them from sending or receiving transmissions. Many providers permit certain white-listed incoming phone numbers and will allow the driver to make an outgoing call in an emergency. On board cameras or car “black boxes”: Some units, called dash cams, record drivers (“cabin view”) as well as the front view of the road ahead and can be useful in a variety of ways. The recorded video can be used to monitor driving habits, including ensuring that drivers refrain from cellphone use, as well as providing evidence in the event of a traffic accident. Car manufacturer Audi and others have been working with the technology to study driver awareness by tracking their eye movements. With results from these studies, they hope to develop systems to provide feedback to drivers to help them maintain and improve their conscious attention to surrounding traffic. The biggest obstacle to preventing distracted driving is often inertia on the part of companies. They either don’t want to spend the money on funding technological solutions or they may be worried that doing more than paying lip service to banning cellphones would reduce productivity. A typical sales force may spend a bulk of their time on the phone, talking to customers, calling prospects, etc. while driving between appointments. Yet, in a 2010 survey by the National Safety Council of Fortune 500 firms, only 7 percent of companies with cell phone bans in place reported productivity declines, while 19 percent thought productivity had increased. David Teater, president and founder of FocusDriven LLC, and the father of a boy who was killed in a distracted driver accident, thinks productivity loss is a red herring. “Being a former CEO myself and having probably spoken to hundreds of CEOs over the years and hundreds of companies that have put these policies in place, maybe thousands, I’ve never heard of, not only not heard directly, I’ve never even heard of a company saying ‘we put this policy in place, and it hurt sales commissions; it hurt productivity; it hurt customer service; not even one comment on that anecdotally in the last 10 years, which I think is amazing,” Teater told CNN. Of course, in the long run, driverless cars could start making these concerns irrelevant. For help mitigating the problem of distracted driving in your company, please contact us.